Allotropes are different forms of the same element. Three different allotropes of carbon are shown here as examples: diamond, graphite and C60 fullerene. Diamond is made up of only carbon atoms, where each of those atoms has a strong covalent bonds to 4 other carbon. Every one of carbon’s 4 outer electrons is involved in one of these strong covalent bonds. Diamond is extremely hard because it is a giant covalent structure with many strong covalent bonds. Because it is hard, diamond is used in high speed cutting tools, eg diamond-tipped saws. Graphite is also made of only carbon atoms, and is also a giant structure, but it is formed of layers where each carbon atom has a strong covalent bond to 3 other carbons. This means each carbon atom has one electron not involved in a covalent bond, and these electrons form a sea of delocalised electrons between the layers. Each layer is a giant structure, with weak forces of attraction between the layers. Graphite is used as a lubricant and in pencils because it is soft and slippery. Graphite is soft and slippery because it has weak forces of attraction between layers. These layers can easily slide over each other. C60 fullerene (also known as a buckyball) is also made of only carbon atoms, but it forms molecules of 60 carbon atoms. 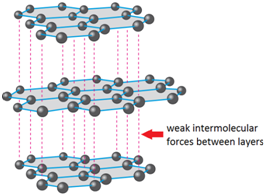 The molecule has weak intermolecular forces of attraction between them which take little energy to overcome. Hence C60 fullerene has a low melting point, and it is soft. 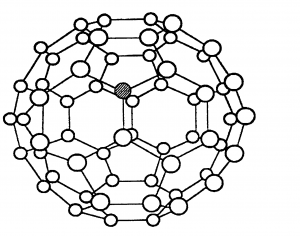 C60 fullerene cannot conduct electricity. 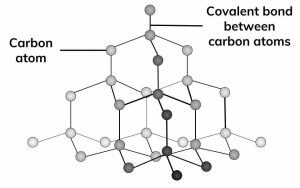 Although in each molecule every carbon is only covalently bonded to 3 others and the other electrons are delocalised, these electrons cannot jump between different molecules.